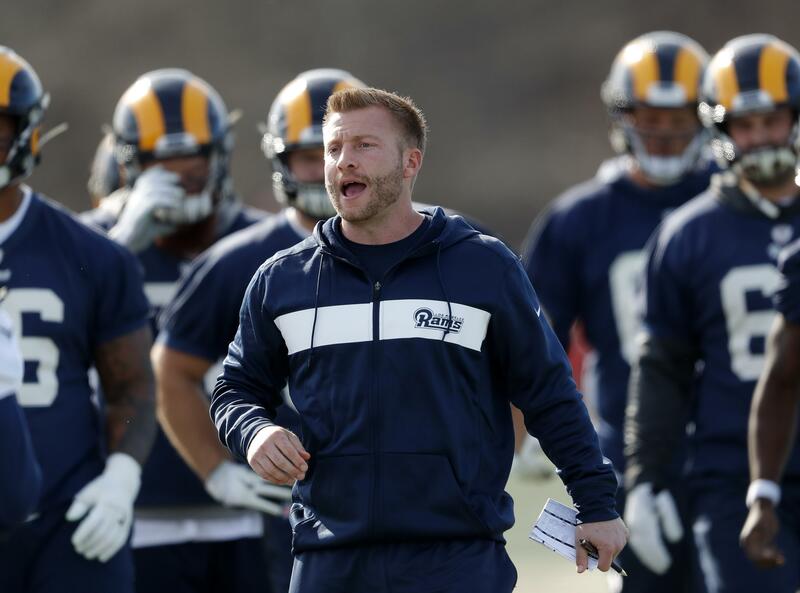 UPDATED: Sat., Feb. 2, 2019, 7:13 p.m.
ATLANTA – The tenets of Sean McVay’s coaching strategy are never far from sight at the Los Angeles Rams’ training complex. “We Not Me” is emblazoned everywhere from the Rams’ playbooks to huge wall signs in the locker room. “The Standard Is the Standard” adorns T-shirts. “Trust the Process” isn’t a sarcastic joke in Thousand Oaks, California, as it became among basketball lovers in Philadelphia. It earnestly greets every player in large letters when they cross the Rams’ facility for team meetings. In just two years in charge, the 33-year-old McVay has utterly changed – or perhaps created – the identity of a franchise that had 13 consecutive nonwinning seasons before his arrival. Though they’re years away from having the success necessary to finish it, the foundation is set for a culture that could someday emulate the best parts of the “Patriot Way,” the unofficial name for coach Bill Belichick’s ability to unite his franchise under his core principles. On their way to the Super Bowl on Sunday, the Rams navigated a trying regular season at home, with a mass shooting and two wildfires all occurring near their training complex in Thousand Oaks. According to players and coaches, that adversity and the franchise’s response to it cemented the rightness of McVay’s methods – and through it all, the Rams kept winning. McVay never claimed to invent his motivational phrases, which mean exactly what an outsider would presume. “We Not Me” isn’t Shakespeare, but the NFL isn’t English lit class. McVay’s cutting-edge offensive acumen and coordinator Wade Phillips’ defensive know-how are the pillars beneath this Super Bowl team, but the Rams believe McVay’s commitment to simple, direct communication is another key component. The players know what McVay means because he repeats his messages constantly, and then he shows them with his actions. His players have responded in kind, and the result is a tight-knit group of disparate personalities that could win a championship this weekend two years after many of the same players went 4-12. Brockers joined the Rams in St. Louis in 2012, and he endured five straight losing seasons before McVay arrived. When asked to name the biggest changes during his Rams tenure, he can’t stop: “The leadership we have. The coaches we have. How confident we are in our game plan. How confidently we go into each game. The results are indeed beautiful: The Rams have won 26 of their 35 games since McVay took over. Los Angeles is 15-3 this season and on the brink of a championship despite a tumultuous autumn. Twelve people were killed less than 5 miles from the Rams’ training complex on Nov. 7 at the Borderline Bar and Grill. Later in the month, wildfires forced dozens of Rams employees, including Phillips, and their families to evacuate their homes. The Rams responded by taking care of their work and then striving to improve others’ lives. Along with extensive charity fundraising efforts fronted by quarterback Jared Goff, the team welcomed thousands of victims and first responders to their Monday night home game against Kansas City before Thanksgiving, an epic 54-51 victory. Published: Feb. 2, 2019, 6:22 p.m. Updated: Feb. 2, 2019, 7:13 p.m.